We arrived in Delhi about midnight after our train was delayed (again). A more modern train however (modern in the loose sense of the term) which kept us well with free food of good quality- samosas, dahl, curry and tea. We had to say goodbye to Binu as he was to leave us after this leg. He was a great CEO, and good guide to our first experience of India. We also had to say goodby to 7 members of group and joined them for a beer (or 4) on the roof of our hotel in the ‘bar’ (more lawn chairs in the midst of a renovation). It was sad to say goodbye to some new friends. In the morning, we had to change hotels and put in a much needed laundry wash (although we’ll be doing more ourselves in the future as it was horrifyingly expensive!). We met up with some of the remaining members of our group and went sight seeing around New Delhi. 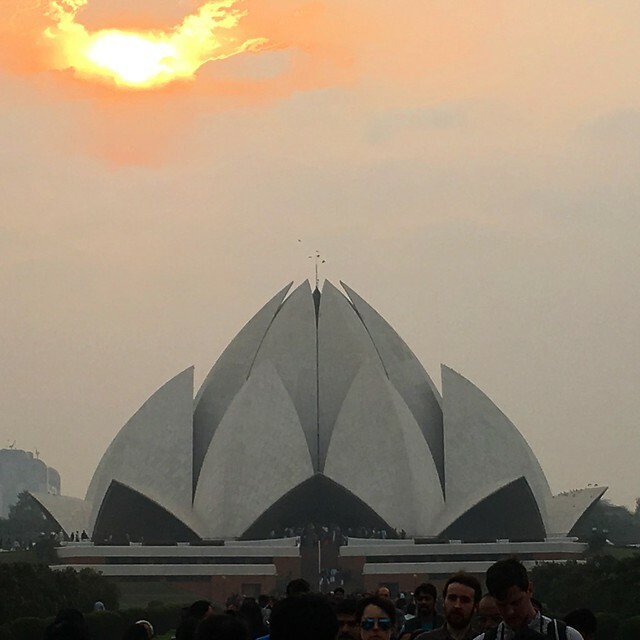 We each had different things we wanted to see: Mike and I- The Red Fort and India Gate; Ian- The Tomb of Humayun; Marianela- The Lotus Temple; and John was happy to see it all. Ian sorted us an uber and we headed to the first stop, The Red Fort. Completed in 1648, The Red Fort is made from red sandstone and is 2.4km in length set out in a irregular octagon. Built by king Shah Jahan (who also built the Taj Mahal) it became the epicentre for the new capital city. 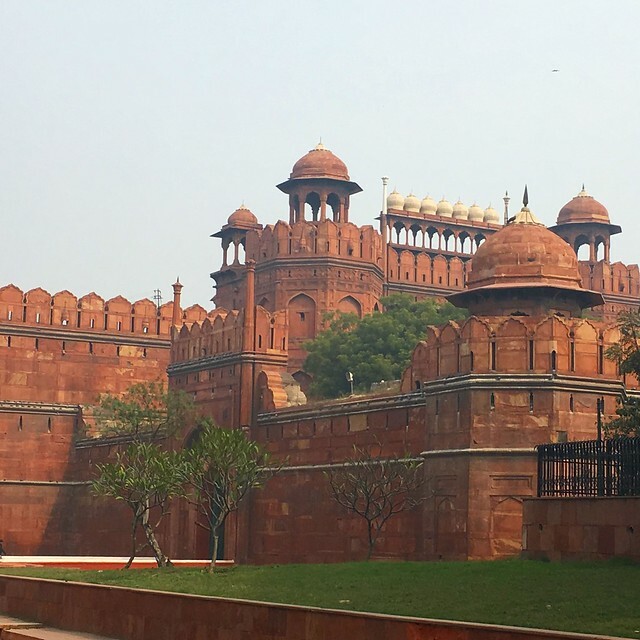 We arrived at Lohori Gate (the exit) and walked around the impressive walls to the Delhi Gate. What became apparent was the sheer size of the structure and height of the walls. We paid for entry 500 rupees (30 for locals) and made our way inside. Impressive views were abundant and we snapped away. The interior was a vast collection of buildings used to receive guests amongst gardens. We wandered and ambled- Ian even got told off for hopping a barrier! Tourists were everywhere, Indian and western as well as school groups- so people-less photos where impossible…almost. Next Ian had no signal so we took an electric rickshaw to the Indian gate. We agreed a price, 300 rupees and set off, 4 in the back and me upfront with the driver- the breeze giving me goose bumps. After a long journey of 40 minutes we arrived- it was becoming apparent that New Delhi is a huge city with nothing close together. Our driver demanded 500 rupees but we ignored as we had agreed 300 rupees. 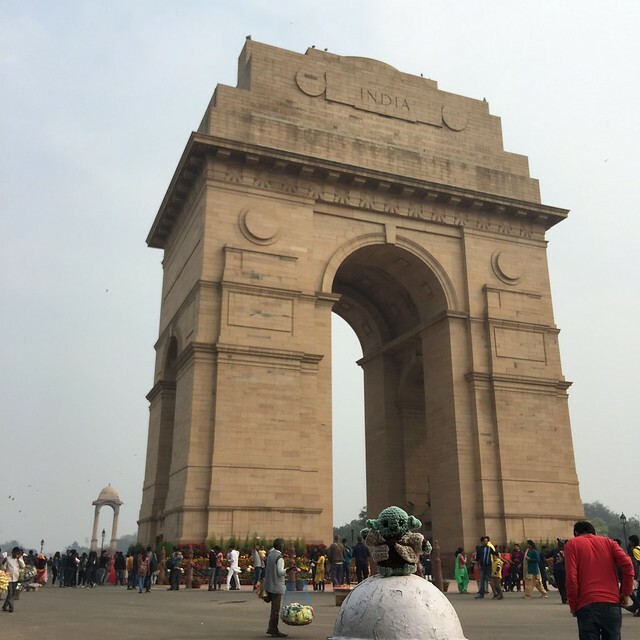 The India Gate was huge- 42 metres high. Quite imposing. Quite similar in size to the Arc De Triomphe. Built in 1931 as a war memorial to the 90,000 Indian soldiers who died in WW1, it is quite the tourist site. Expect lots of ‘tat’ sellers, food vendors and people offering to take your photo for a price. We walked around, took photos and selfies, lost and re-found John and ate a few snacks which were reasonably priced given the touristy nature of the area. Next up was Humayun’s Tomb. Another long tuk-tuk ride (the city is huge) and another 500 rupees we entered. Walking through the entrance gate you are obscured a view of the building until you walk down the long path and through the lofty double storeyed gateway. You are greeted with a breath taking view of the red and white building. The Taj Mahal was inspired by this place and you can see why. The splendour of this grand monument is overpowering, it is set in a large square garden with fountains and water ways. The scale, precision and symmetry is beauty to behold. We walked the gardens and took far too many pictures, especially the shots of the building reflecting in the water. Inside is less impressive but still worth a look. A must see if you are visiting New Delhi. We then organised a tuk-tuk to the Lotus temple. While not old (built in the 70s) it was architecturally impressive. Again the ride was another 45 minutes. The scale of the city was now apparent and clear why 50 million people fit in here. If visiting New Delhi I would recommend a visit to take a picture of the temple, but there is really no need to venture inside. It is free however, but inside it are just rows of pews in a vast lofted space. The gardens are pretty and well maintained and take 30,000 litres of water a day! Shocking considering there are people begging on the street for food and water. Our tuk-tuk drivers waited for us and we had wanted to go to the Qutub Minar (a 1000 year old 72.5m tower) but being past 5 we were advised it was shut, and it was quite a drive…surprise surprise. So we opted to head back to the hotel, plus we had to meet our new group at 6pm. The drivers however decided to take us to a market, or rather a glorified shopping centre. We stopped, kindly looked around for 2 minutes and got back in to their disapproval. The drive back was busy, full of traffic and pollution- it is not surprising given the amount of cars and tuk-tuks it is the worlds second most polluted city behind Beijing. We arrived late but the meeting hadn’t started. Dinner and bed and a good nights sleep were needed as we were off early to Agra; home of the Taj Mahal!